I hope everyone enjoyed a restful holiday with their loved ones. I had a wonderful break from work with my family - I think this was one of my most enjoyable holidays yet! In the run up to Christmas, I was hard at work on gifts, including quilts, aprons, handbags, and pillowcases. 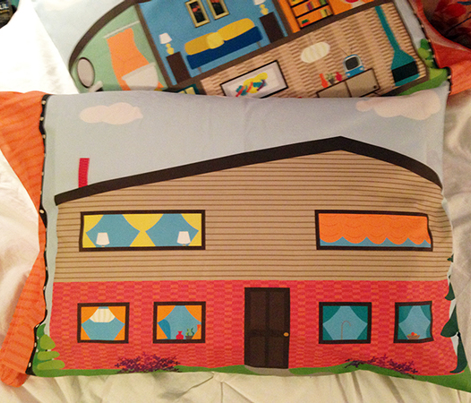 I was most excited about two quilts in particular, for my daughters. These poor kids have a mother who sews incessantly but had never made them quilts of their own. I remedied this situation for Christmas. 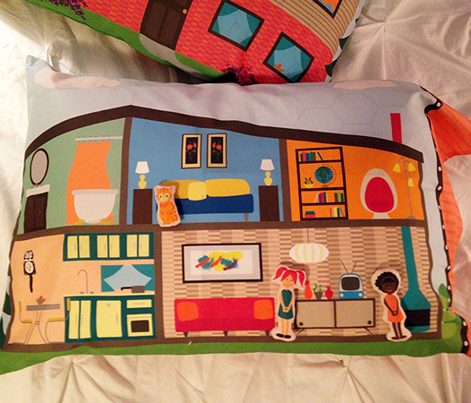 The other project of which I am pretty proud is a dollhouse pillowcase I designed. I sewed a few of these up as gifts for little friends, and they were a huge success (if I do say so myself). This design is available as a one-yard, easy-to-sew project (complete with dolls and a kitten!) in my Spoonflower shop. With Christmas projects behind me, I'm ready for an exciting new year! I hope you are too!